I wrote this blog post four years ago after the Vancouver Olympics. I thought I would repost it following yesterday's big gold medal win for Canada - and our generally fantastic showing at the Sochi games. And I want to add this for those who wonder why Canadians get so fiercely proud during the winter Olympics: we are always that proud, we just take this chance to be loud. I spend most of the Olympics being lovingly harassed by my American friends, particularly the hockey fans. Suddenly, Canada gets attention - we are rivals, we are annoying, we are disliked, we are noticed. We love it. In my experience, Americans like to pretend that Canada doesn't exist, or at least doesn't matter. Hence all the jokes about being the 51st state or "America's hat." Nevermind that we are the USA's biggest trade partner, largest provider of oil, a member of the G8, a strong presence in the UN, NATO, NAFTA, the Commonwealth, were a crucial presence for the entirety of both world wars, the US's strongest and most loyal ally and share the world's largest unprotected border. We have one tenth the population of the US, yet have a fairly pristine and highly respected reputation internationally. We are peaceful, peaceable and peacekeepers. We are not a superpower. We aren't perfect, but we are great. We are a country that is deserving of tremendous respect, even when we don't receive it. As a nation we tend to be quiet and humble, not willing to engage in culture wars. We're not trying to be better than the US, we don't want to be the US. Please understand: we have nothing to prove. We're not your jealous little brother. We are Canada. Every once in a while we get the chance to shine in our own way on a world stage and we make sure to take advantage. And Americans are starting to take notice. Not even willing to let us have our hallowed sport, we get under your skin with our hockey gold. And frankly we love it. Not always loud, but so very, very proud. 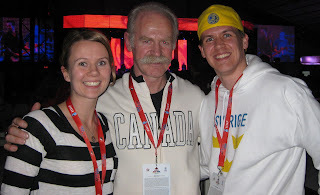 8 days ago I watched Canada's men's hockey team win the gold medal against the US on home ice. I watched with my hands over my eyes, pacing the room, and developing ulcers, but I watched. I wasn't sure I was going to. We were on vacation in northern California that week and were heading to wine country that day. After the heartbreak I endured a week before (Canada lost to the US in the round robin) and the vivid memories of the stress I felt watching the same game 8 years before in Salt Lake (Canada won gold then also), I felt like it might be in the best interest of my mental health to avoid the game and to drink some wine. At least that was the plan. I woke up with a nervous stomach, and the nerves only escalated through our drive, my frantic search for radio coverage of the game and our eventual arrival at my aunt and uncle's hotel room in Sonoma during the first intermission. Not watch the game? Who was I kidding? I couldn't miss that game. As Neil put it, it was a life event. I'm sure you're rolling your eyes at the hyperbole, but I assure you I exaggerate not. It wasn't just a hockey game, and it wasn't just that our collective Canadian pride was on the line, it was that and more. It was the culmination of a two week celebration of my country, my home that I miss so much. After Canada's loss to the US in the round robin, I was inconsolable. No, it wasn't anger at the taunting text messages I received (I know they were all sent in love), and it wasn't just the loss. I was having a hard time putting my finger on the source when Adam (oh how I love him) did it for me. I hated that I wasn't in Canada to watch that game. I wanted to be in Vancouver still, surrounded by fans as fervent (or more so) than I. I was missing home, and it all came crashing down on me then. Our Olympic experience was amazing. We spent 6 days and nights total in Vancouver. 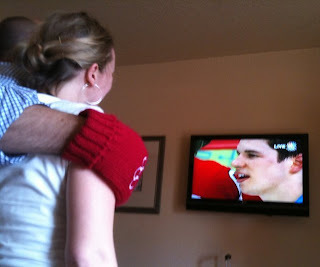 We watched the Opening Ceremonies (which I LOVED) with some of my closest family and friends. We saw the fireworks outside Kara & Tyler's front door as we were watching the coverage on TV. We went to Robson Square, saw the torch, the Olympic rings, and the general pandemonium that was Vancouver. We went to a men's preliminary curling match - and were overwhelmed by the flags, the spirit, the curling savvy and the NOISE of the fans. We are the proud owners of the autographs of the gold medal winning men's curling team. We went to hockey games and cheered at the top of our lungs, even though we didn't care who won. We sensed the excitement and were part of it. The 'Olympic spirit' isn't just a cliche and it was palpable in Vancouver. Undoubtedly my highlight was the VIP room of Molson Canadian Hockey House. As the lucky recipients of unused VIP passes, Kara, Tyler, Carter, Adam & I spent the night enjoying free drinks, food, and one of the poshest lounges I have ever been to at one of the most coveted venues in Vancouver. The night before all of team Canada plus Gretzky were in the VIP lounge post win, and although they weren't expected that night, the thought alone was enough to make me permanently giddy. They didn't show up, but Lanny McDonald did (Calgary Flames Stanley cup winning captain in 89). Meeting him was... maybe the highlight of my life? Point is, we had the best time. We were able to see and do so many cool things. But the best part, the essence of it all was being in Canada, with Canadians, watching Canadian TV coverage and unashamedly reveling in all things Canadian. For me, the Olympics was two weeks of celebrating Canada and bursting with pride. We're back in the States now and will happily live here for the foreseeable future, at least the next few years. This is Adam's home, and it's mine for now - and you know what, I love this country too. But when Crosby scored the game winning goal and I stood singing "Oh Canada" with my aunt and uncle there was nothing but pure unadulterated joy (and yes plenty of pride) even from afar. Sure, it was just a hockey game, but it was so much more. It was a celebration for Canada, of Canada, in Canada. With glowing hearts, indeed.